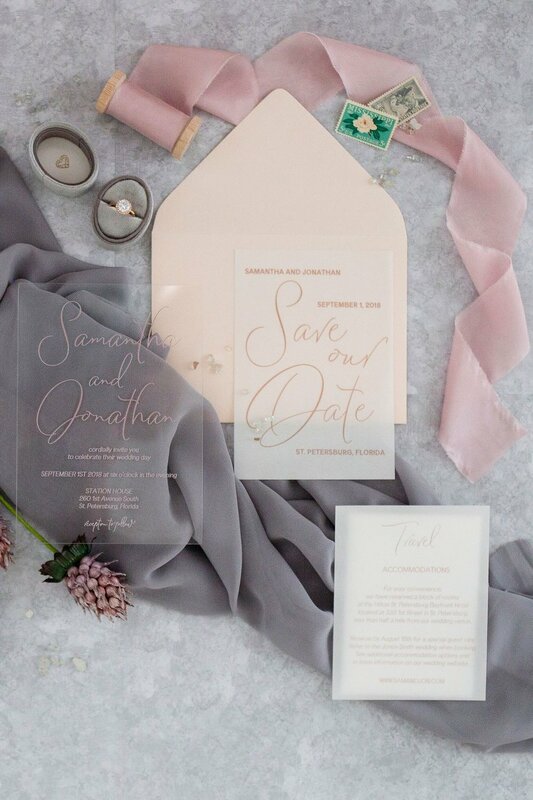 There are so many factors to consider when designing your invitations. Below are some of the more common options, and you can mix methods of print as well, depending on the final design of your invitations. This is most recognized print method. It uses high-resolution, digital color to print flat designs. The result is a smooth, flat finish. This is the most cost effective method of print. This is a unique printing method that applies a metallic foil to the surface of the paper to create a shiny finish. 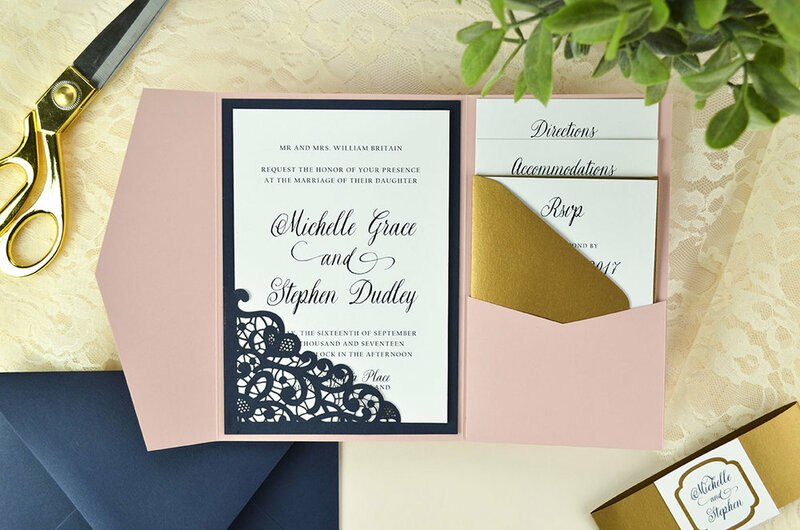 This print method is popular if you want to add touches of gold, rose gold, copper or silver accents to your invitations. You can do a traditional foil stamp, where a metal plate is created with your design, it’s heated, and a layer of foil is placed between this plate and pressed into the paper. Another way is to do a digital foil, where instead of a plate being created, the design is digitally printed and then the foil is adhered to the printed surface. This is the more cost effective method. A custom plate is made and a press is used to physically imprint the design into the paper. Ink is mixed by hand. The texture of this method makes it very popular, and one of the higher end methods of printing. Pricing varies by the number of colors, the quality of paper, and if you want to add any details such as edge painting. Sometimes the design of the invitation dictates that we mix digital with letterpress (in instances of personalized crests). 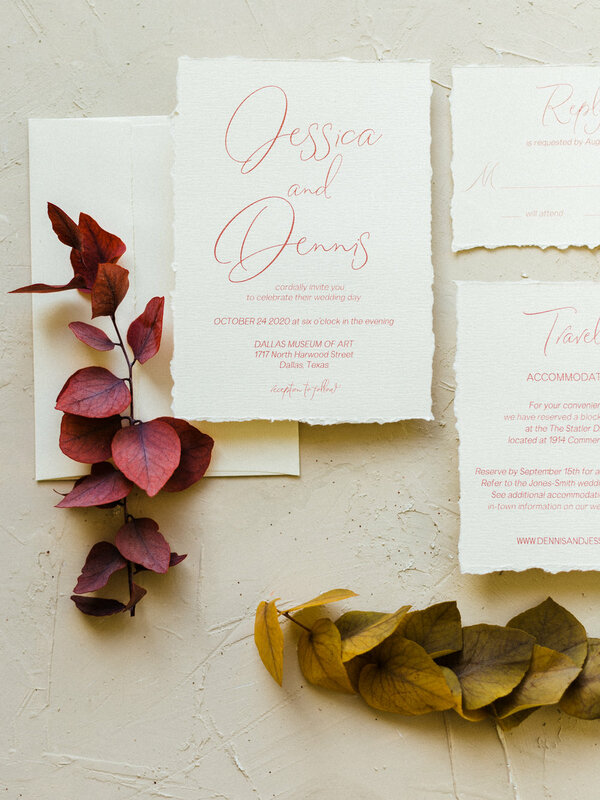 You can also save cost by only implementing letterpress on your invitation, and use digital printing for the rest of your suite like your information and response cards. Vellum is a thin, translucent piece of paper that can be used alone for invitations, or used as an overlay to help bring out or enhance a design feature (like a custom crest or monogram). Acrylic is essentially a transparent piece of plastic that is extremely unique. If mailing these as invitations, you will have to factor in the added cost of sending these to your guests in a box versus an envelope. Many clients will sometimes use this option for menu cards as well. Use our free download to help you organize your guest list. This outlines how to input your guest names, and will let you know the total number of households, aka the total number of invitations, you’ll need. This number is different from your guest count.